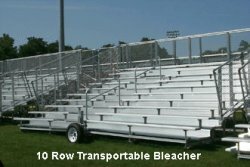 Satisfy spectator seating requirements with a deluxe transportable bleacher set from BuiltRiteBleachers.com. Share one bleacher set with multiple sports fields. 10 Row - 24'L -Preferred Transportable Bleacher (2 foot planks)- Seats 160 - Weight 3934lbs.